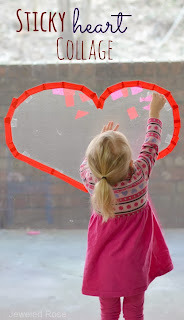 With Valentine's Day quickly approaching we are having lots of fun adding the scent of rose into our play activities. 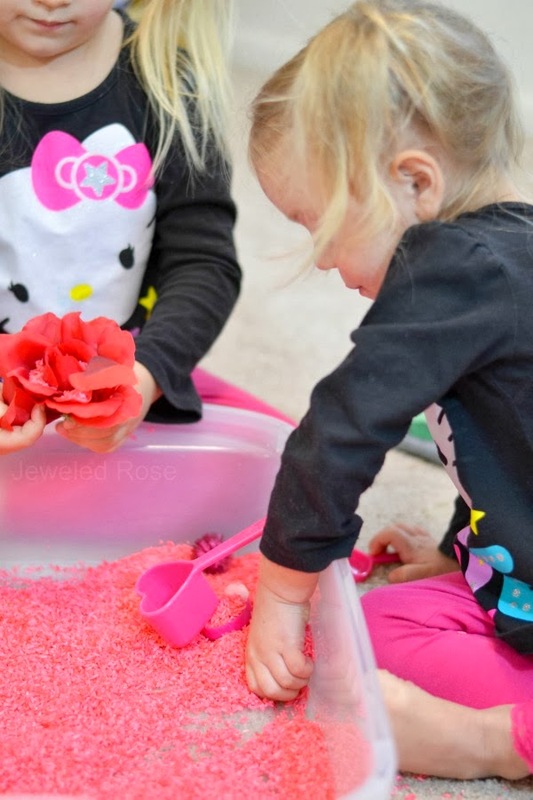 This rose scented rice smells glorious, has therapeutic attributes, and there are lots of fun ways for kids to play and explore. 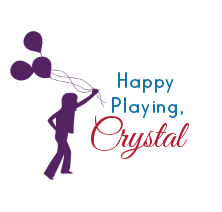 For all the best kids activities follow Growing a Jeweled Rose on Pinterest & Facebook. 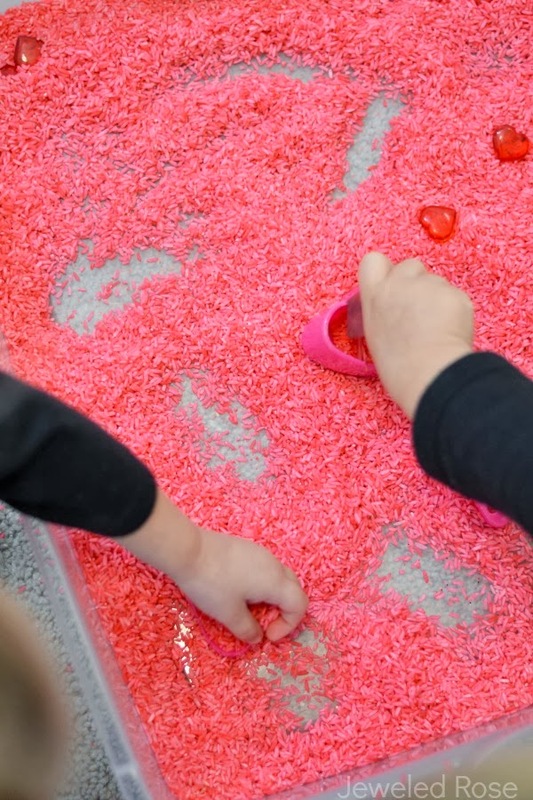 We love rice for sensory play. It is a lot like play sand but cheaper, and it makes a fun sound when it is poured or shaken. It keeps indefinitely, can easily be stored, and vacuums up easily. 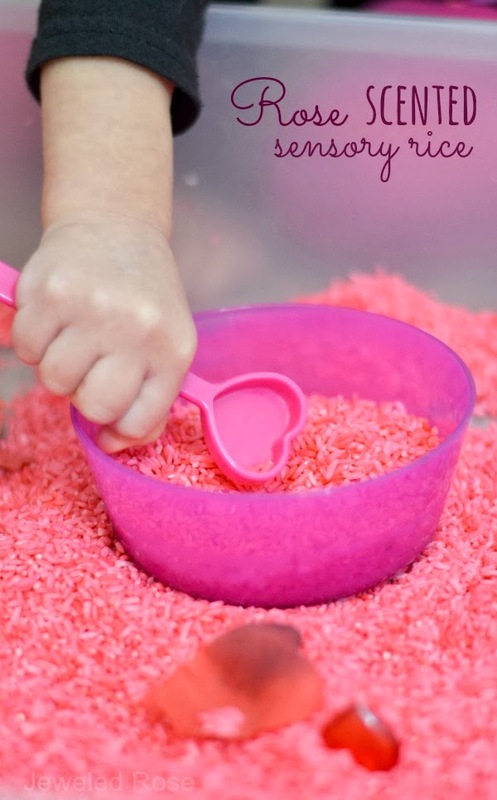 We have made sensory rice in tons of ways; visit our play recipes collection for more ideas. To extend the fun I added a few bowls, heart scoopers, artificial roses, and heart gems to the bin. Rosie and Jewel had lots of fun and found lots of ways to explore. 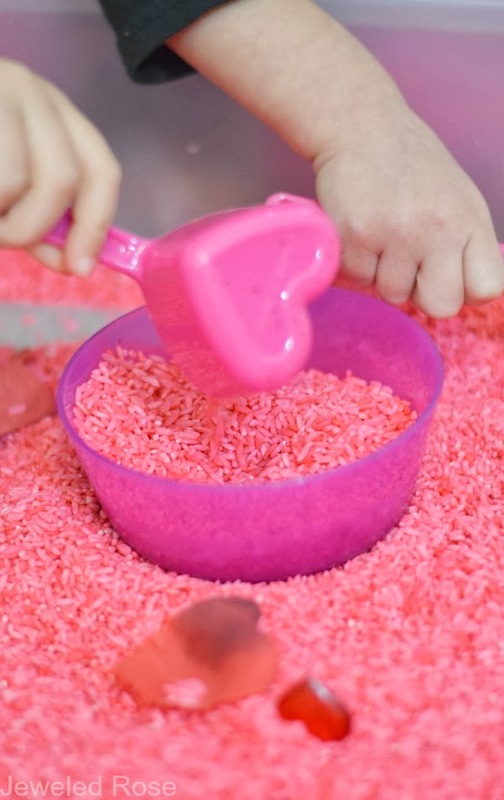 Sensory rice is so fun and lends itself to all sorts of play possibilities. How many scoops does it take to fill the bowl? Which scooper fills the bowl faster and why? 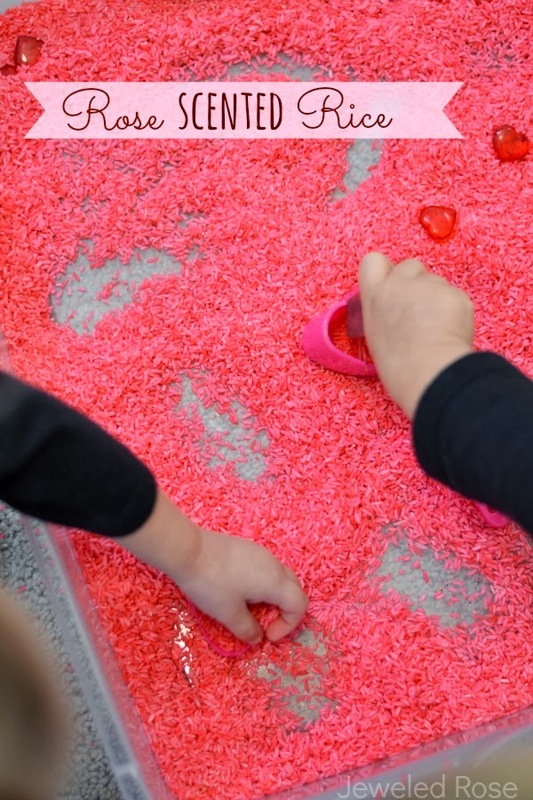 These are just some examples of the learning that I was able to sneak into Rosie and Jewel's sensory rice play. 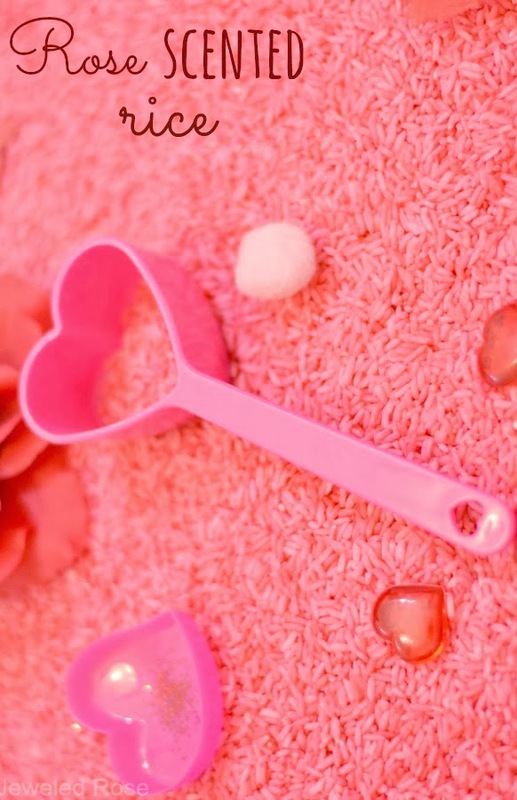 This bin is perfect for play leading up to Valentine's Day, and I know we will be playing with our sensory rice often until then......and probably long after. A Few Tips: I found all of the materials used in this activity at the Dollar Tree except for the rice. We buy our rice in bulk at Walmart for very cheap. Pink food coloring comes in the neon food coloring pack which can be found in the baking aisle of most major stores or online here. You can read more on the benefits of rose oil here. To get the fullest benefit you will want 100% rose essential oil. 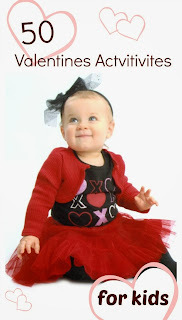 For this activity we used a more inexpensive rose oil.